Claudia and her family arrived in Sedona back in 1985 having migrated over the years from the East Coast to Michigan, and finally to the Southwest. After 18 years in education and learning that there was no high school in Sedona in those days, Claudia went out on a limb and into real estate. She discovered that those years of teaching prepared her with many skills that she has utilized in her real estate practice. Her goal as a new REALTOR® was to become a respected entity in her profession. She has never let go of that goal. Claudia teamed up with her son in 2003. Together, they are able to address their clients’ concerns from the perspective of both genders and to cross generations. They work diligently to provide coverage and service whenever needed. 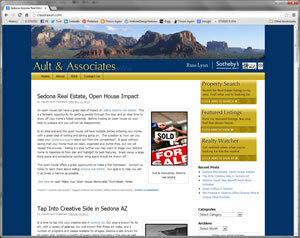 What’s it like to live in Sedona? From a very personal level, Claudia will tell you that her time in Sedona since 1985 has represented the most positive part of her life’s journey thus far. She attributes that to several things: the 300+ days per year of sunshine, blue skies and rarified air; the small-town atmosphere allowing a resident to know those folks that one sees often – the banker, the grocery store clerk, the owner of the hardware store or card shop; the beauty that she sees everyday as she travels the roads of Sedona and the Verde Valley. Through her previous profession and through her current one, Claudia has been devoted to education to help her to be the best professional that she can be. She parlays that education to her clients with valued leadership as she and her sellers or buyers work their way through their transactions. Experience isn’t expensive; it’s priceless!